Stand Up, something unknown to the Telugu audience is now being introduced through the Star Maa Television’s brand-new show, Great Telugu Laughter Challenge. 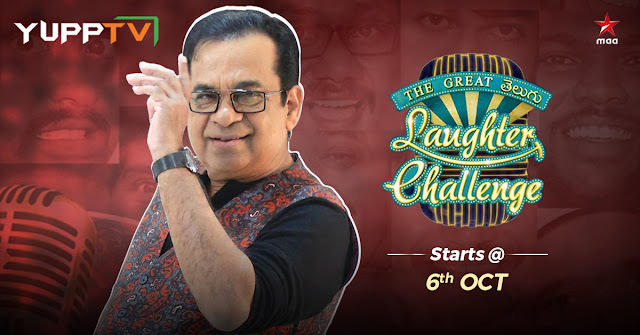 Telugu Actor, Star Comedian, Guinness World Record Holder, and Padma Shri Awardee Brahmanandam is the judge of this show. Great Telugu laughter challenge is the Telugu version of the highly popular Hindi shows Great Indian laughter challenge. The Telugu show will commence from 6th of October 2018 on Star Maa TV and you can watch it Live on YuppTV from select regions. Before you want to know what, the show is about let us know something about stand-up comedy. Stand Up comedy is an art form where an individual performs on stage in front of a live audience and makes them laugh by reciting jokes, stories, anecdotes, one-liners etc. The art form has been around since 400 BC and was used by critics to express their views and opinions without censorship. It once again took pace in the 18th and the 19th centuries in UK and US. Though a similar kind of art forms with the names Burra Kathalu (Telugu), Chakyar Koothu (Malayalam) is prominent in India (Chakyar Koothu- since 16-17th centuries & Burra Kathalu since the 1940s), stand up comedy as a mainstream art form entered India in the late 20th century. Comedians like Johnny Lever, etc., acted as fillers in many Bollywood Functions in the 1980s. It was only in 2005 that India has come up with its own version of Stand Up providing a pedestal to the comedians through the Great Indian Laughter Challenge. Indian Stand Up grew at an exorbitant pace from then on and now Stand Up comedians perform across India in various cities mostly in Hindi and English. Though familiar to Hindi audience from a long time, modern standup is practically unknown to ordinary Telugu audience. Some programs like Patas, have encouraged stand up but they were short 3-5 minute skits that seemed like fillers. The show is first of its kind in Telugu and has recently conducted auditions in major cities of Andhra Pradesh looking for contestants. With the completion of the auditions, it is all set and ready to be broadcast on Star Maa TV channel from 06th October 2018. It will be broadcast every weekend (Saturday and Sunday) at 09:00 PM IST. You can watch the Great Telugu Laughter Challenge on Star Maa Live on YuppTV from Saudi Arabia, Qatar, UAE, UK, Europe, Australia, New Zealand, Malaysia, and Singapore.